Chances are that if you’re cooking much, then you’re up to your ears in fresh herbs this time of year. Whether they’re fresh out of the garden or purchased at the store, you likely have more than you need that very moment. So the question arises of how to store fresh herbs so they last a long time and you get your money’s worth. When you’re working with a recipe, you often only need a few leaves, a handful, or sprig of whatever herb you’re working with. 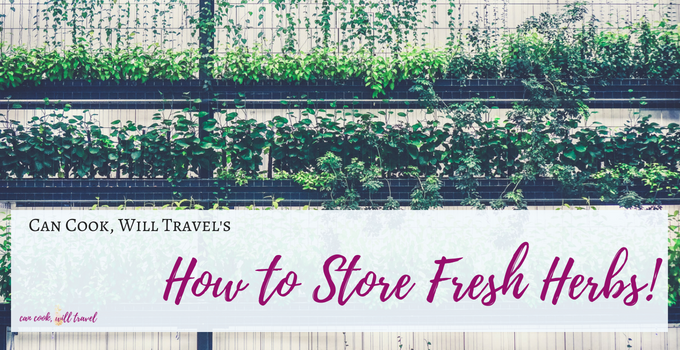 So how to store fresh herbs is pretty important, because you’re needing to keep the rest in good shape. And if you’re anything like me, you probably forget about your herbs and then they end up going bad. 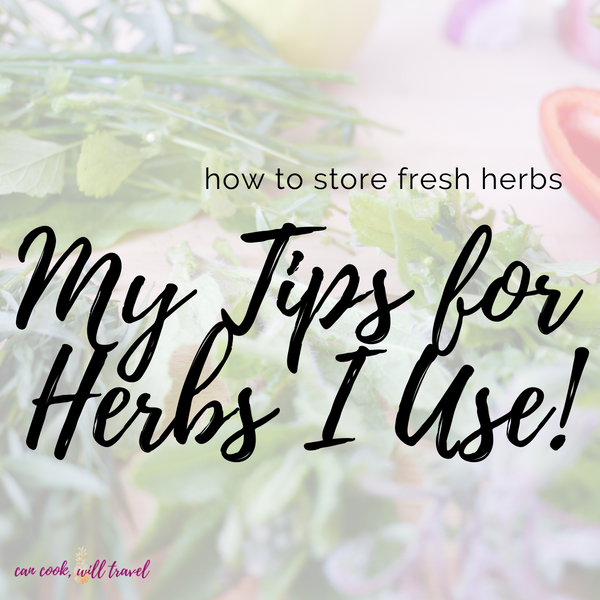 In the past, I didn’t know how to store fresh herbs, so I often kept them in their container or bag. But that’s not necessarily the way to go. A couple of months ago, my mom’s herb garden was exploding with gorgeous goodies. So I found myself back in my kitchen with LOADS of fresh herbs, and I was scratching my head with how to not let them go to waste. Lucky for me, my sister loves to research stuff and she sent me an article that I dove into. I learned a ton, and it was interesting, because some herbs I was storing properly. But other herbs had me knowing that I didn’t know how to store fresh herbs at all. So I thought I’d share what I found and what’s been working with me. 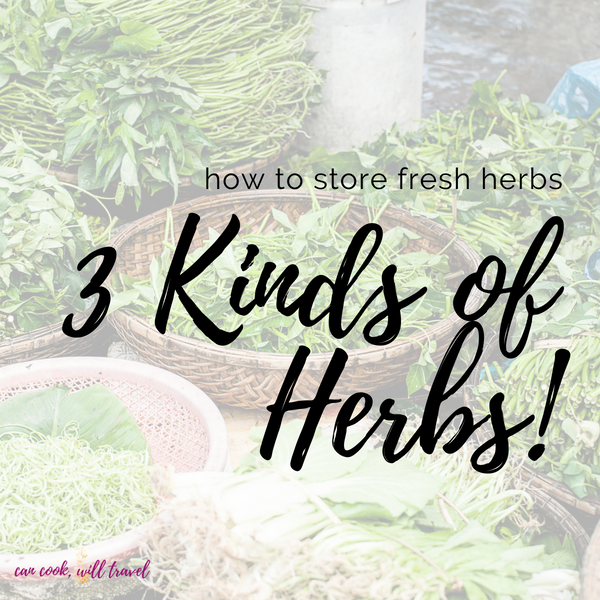 The first discovery is that there are 3 types of herbs that dictate how you store them. It totally makes sense, but I’d never really thought about it. Hardy – These are the herbs that aren’t quite as fragile, and they include things like rosemary, thyme, mint, etc. Tender – The more fragile herbs that need water and a cool home, which would be parsley, cilantro, and tarragon, for example. Basil – It’s my favorite of the herbs, but that’s not why it gets its own category. It is a bit more special and needs warmer air and sun. Based on the kind of herb, you need to treat it differently. And I’m not going to lie here, I was a bit skeptical that any of this would matter. But it totally does! Wrapped in dry paper towels – For the HARDY herbs, you’ll wash them, let them dry and then roll them in dry paper towels. Store them in a zipped storage bag in the fridge and unroll whenever you need them. Refrigerated in container – For TENDER herbs, this method really surprised me. First wash and dry the herbs. You’ll put some water in a storage container, then put the stems in the water folding the herbs into the container so a lid can be placed on it. Seal the lid and store in the fridge and you won’t believe how fresh these herbs stay. In glass jar on counter – For the basil, you’ll grab a glass or glass jar and fill it with some water so that the stems can sit in the water. Then simply keep them on the counter and pick off leaves as you need them. Make sure you wash the basil well first. First make sure that you wash all of the herbs, and then dry them on a paper towel. I like to use a fruit and veggie spray and lightly rinse with water, shake them off in the sink and then let them air dry on paper towels. If you’re short on time, then pat them dry with a paper towel. As mentioned above, you’ll use the glass jar method here. Keep them on the counter and then if you see any bad leaves or stems, remove them so they don’t spoil the others. This is in the tender herb category, and you’ll store them in a storage container with some water in it and the lid on. You can have multiple tender herbs in one storage container, so don’t worry about keeping them separate unless you want to. For a hardy herb like this one, roll the pile of herbs in a dry paper towel. Then store them in a large plastic storage bag. You can keep different herbs that you’ve rolled up in the same storage bag if you prefer. Then unroll and grab what you need, roll it back up, and store again as you’re needing it. So easy! For a full rundown and where I found a lot of my info, check out Serious Eats’ post here. 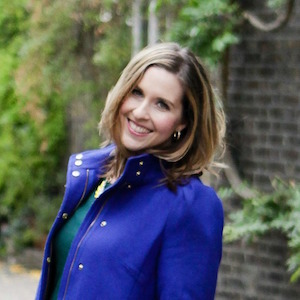 The post overflows with info and different tests she did, so it’s a fantastic resource as well. Adding fresh herbs to a recipe brings complexity and major flavor with little effort, so they’re great to have around. There are some herbs I use more than others, so I’m sharing some simple recipes that I hope you enjoy! Mint Water – This one is super simple, where you fill a pitcher with filtered water and then add a nice handful of fresh mint to it. Keep it in the refrigerator and drink on it throughout the day. Pimms & Lemonade – My favorite British cocktail is this one, and you can add fresh mint to it for major flavor. It’s refreshing, light, and crazy good, so check out all the details here! Rosemary Potatoes – Clean & cut up potatoes if desired, then toss with olive oil, salt & pepper, and chopped rosemary. Bake at 350 for 20 minutes or until brown and starting to crisp and then enjoy! This is similar to how I made these potatoes to go with a dairy free French Onion Dip, so check out that post. Rosemary Polenta – I made this recipe in year 1 on the blog, and after remembering it from this recipe post, I’m DYING to make it again! Oh holy flavor with some heat, fragrant rosemary, and a cheesy polenta that I’d serve next to anything. So please check it out, and then you can thank me later. Basil Chicken Salad – This recipe is a family favorite where you poach chicken, and then toss it with fresh tomatoes, mozzarella, basil in a creamy dressing. The full recipe is on the blog, so check that out here. Basil Lime Butternut Squash Chicken Bowl – This recipe is perfect during the Fall, but you really could enjoy it anytime. If you can’t find squash, you could easily use sweet potatoes instead. So click that link and dive into the recipe! Strawberry Basil Moscow Mule – Enjoy this cocktail, which is great in the Summer with fresh berries & basil. This one is a popular post on the blog, and it’s for good reason, so check out the recipe and enjoy! Roasted Garlic Thyme Mushrooms – These mushrooms are pretty decadent as they’re topped with a thyme garlic butter and breadcrumbs. But oh my, they are insanely good & easier than they look! For step by step instructions and the recipe, then click here. Apple Thyme Cake – If you love to bake, then this recipe will be a cinch for you. And even if you don’t, then it’s simple to make with my step by step instructions and the recipe here. The thyme perfumes this cake with chunks of apples in it and it’s crazy good! Dijon Tarragon Turkey Meatball Buddha Bowl – Tarragon goes so well with poultry, and it adds the perfect freshness to this bowl. I love how fresh and easy it is to make, and wow is it fantastic. Makes me want to make these meatballs again ASAP, so read the recipe and step by step photos here. Lemon-Tarragon Chicken Soup – The tarragon takes this chicken soup to another level as does the garlic paste you make. It’s a rich soup that’s perfect when you’re under the weather, and the full recipe and photos are here. Shrimp Summer Rolls with Parsley – These spring rolls are yummy and the pop of green from the parsley through the wrapper is so pretty. I love using it for a garnish and mild flavor. If this sounds good, then check out all the details here. Lemon Tuna Salad in Avocado – A light, bright, tangy yet creamy tuna salad that fills half an avocado makes a healthy lunch. Parsley then tops this gorgeous avocado half for the perfect finish. Click the link for the full recipe and photos to walk you through it. Shrimp & Rice Noodle Pasta with Cilantro and Basil – Seriously this is so delicious! Tons of veggies, marinated shrimp, and an Asian vinaigrette make this one recipe I happily eat on repeat. For all the details to make it yours, then check out the recipe and step by step photos here. Thai Chicken Salad with Basil and Cilantro – There’s a lot of chopping involved, but it’s well worth it for this flavorful salad. If you love Thai flavors, then check out this great dish here to help you use up your herbs and eat well! 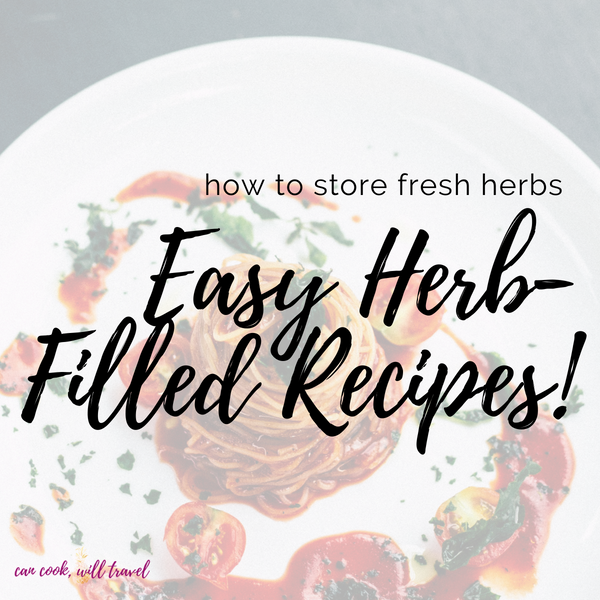 So now you’ve not only learned how to store fresh herbs, but you’ve now got some stellar recipes. I can promise you they’re ones that I adore and have happily devoured, so I hope you enjoy! 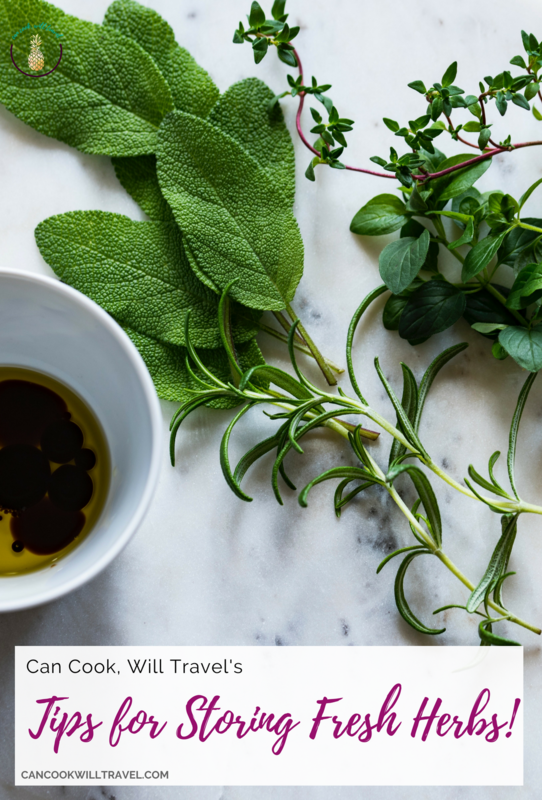 I know this post has definitely inspired me to whip up all sorts of herb filled recipes, so let’s do it! What is your favorite herb to work with, and how do you love to use it? 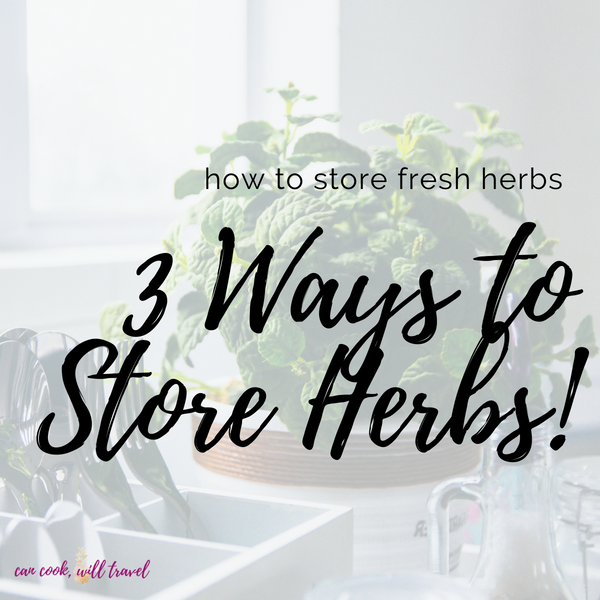 I hope this post has made you confident in how to store fresh herbs now, and I’d love to hear from you. Let me know how these methods work out for you, and what your favorite recipes with herbs are! Comment and let’s then keep this convo going! Stay inspired & enjoy fresh herbs!